If you look hard enough, you’ll find that there’s a wearable suited for everyone. Well, mostly everyone. Seniors are a group that is often left out of the tech conversation. The Omate Wherecom S3 looks to fill that gap. It’s a smartwatch that runs on a heavily modified version of Android Lollipop with a focus on bringing only the most essential phone features to your wrist, plus a few to keep your well-being in check. You’ll find 3G connectivity here, as well as loudspeaker, medicine reminders and touchscreen support. The Wherecom S3 can get calls and texts without the need of a smartphone. Better yet, the cellular functionality adds location and alert services in case of an emergency. But as a current non-senior, perhaps my favorite thing about it is how it looks, which is like a super playful take on the Pebble Time. It seems to be built to take a beating and as a result, it’s 13.9mm thick. But that shouldn’t stand in the way of its utility for those who are gearing to take advantage of the core features it offers. The Wherecom K3 features a 1.5-inch screen running at 320 x 320 resolution, which isn’t too below the current standard of Android Wear smartwatch screen quality. Its innards consist of a dual-core processor running at 1GHz, 8GB of internal storage and 1GB RAM. 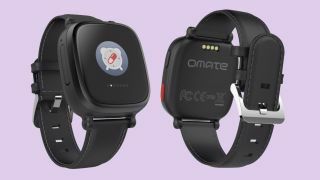 The Omate Wherecom K3 is currently only geared for release in France and Spain, but as this product has a target audience in every region of the world, it could spread its reach sooner than later.